For many years, we have had a subscription to the Huntington Theatre Company, a profession repertory theatre company based at Boston University. We enjoy a variety of productions: drama, comedy, musical, classic, contemporary. It’s something different every time. I have a strong preference for the contemporary productions by new playwrights. This weekend, we were amazed at their production of Arthur Miller’s All My Sons. I wasn’t familiar with this particular play. Like everyone, I read his plays The Crucible Death of a Salesman in high school. I probably saw these plays at least once on stage at some point. All My Sons was hands down the best show we’ve seen at the Huntington this season and is among the best shows we’ve seen them ever do. The play was powerful in content, and the casting and acting were superb. The devastating end left me with tears in my eyes and a catch in my throat. It’s playing through February 7. If you have a chance to see it, I highly recommend that you go. We attended the matinee. When we came home, Howard took Bella for a walk, and I started dinner. 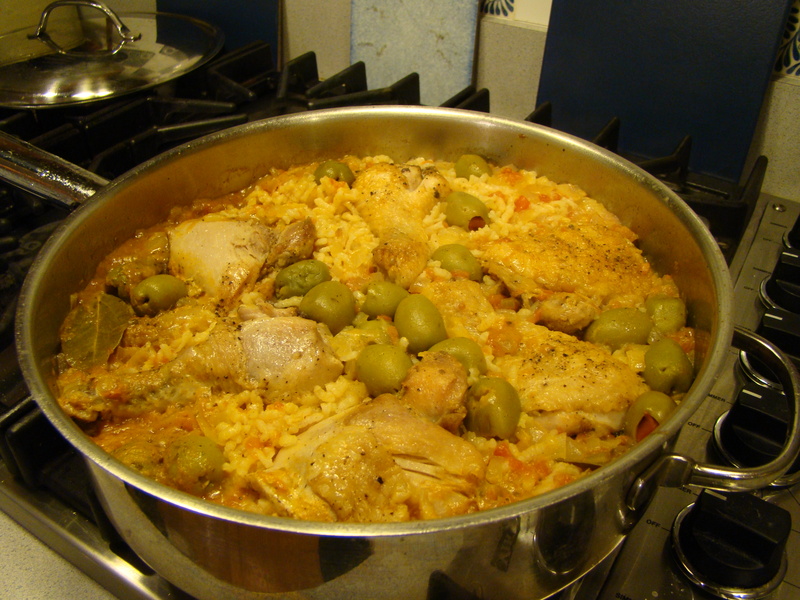 The February issue of Martha Stewart Living had a recipe for Arroz Con Pollo, a Spanish chicken and rice dish. We had our usual monthly package of 3 whole chicken legs from Chestnut Farms, so I gave it a try. It was a winner, though there was way too much rice in proportion to the chicken, so I’d recommend making the dish with eight pieces of chicken instead of six. I made a simple salad from the salad mix we bought at the Winter Farmers’ Market to complete the meal. Combine wine and saffron; let stand until ready to use. Season chicken with salt and pepper on both sides. Heat the oil in a large sauté pan over medium-high heat. Cook chicken, skin side down, until browned, 4 to 5 minutes. Turn over, and cook until browned, 2 more minutes. Transfer to a plate. Reduce heat to medium. Cook onion and garlic, stirring often, until the onion softens, about 5 minutes. Stir in tomato and cook another 5 minutes. Stir in wine-saffron mixture, bay leaves, and salt and pepper to taste. Cook about 5 more minutes, until mixture thickens. Add chicken, stock, rice, and olives. Bring to a simmer. Reduce heat to low. Cook, covered, until rice is tender, about 45 minutes. Stir halfway through the cooking time. Posted on 26 January 2010, in Meat CSA and tagged casseroles, chicken. Bookmark the permalink. Leave a comment.